Oct 26th: Baby Stars Caught In A Galactic Spider Web! 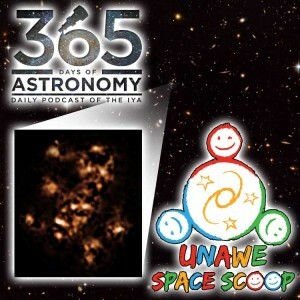 Title: Space Scoop: Baby Stars Caught In A Galactic Spider Web! Baby Stars Caught In A Galactic Spider Web! In the very beginning of the Universe, after the Big Bang, gravity began pulling together clouds of Hydrogen & Helium gas to make stars. Millions and billions of stars were born and bound by gravity into groups that we call galaxies. And gravity even confines groups of galaxies together in packs that we call galaxy clusters. Galaxy clusters are the largest groups in the entire Universe. They contain hundreds or even thousands of gigantic star-filled galaxies along with enormous clouds of blisteringly hot gas (up to 100 million degrees!). Our home galaxy, the Milky Way, with 300 billion stars looks like a tiny village, compared to these bustling cosmic cities. The artwork for this episode has an image created by ESO astronomers using a radio telescope called APEX. It shows the Spiderweb Galaxy Cluster forming. It is one of the oldest galaxy clusters ever discovered, and it’s made up of dozens of smaller galaxies all merging together! Like a construction site on Earth, galaxy clusters are dusty while they are forming. This makes it difficult to see exactly what is happening inside them. Luckily, we now have telescopes that can peer through the thick haze: radio telescopes. Using APEX (which stands for the Atacama Pathfinder EXperiment) astronomers have for the first time managed to look at stars being born inside the Spiderweb galaxy cluster. The APEX radio telescope is a prototype of the dishes that are used by the ALMA array that shares the same plateau in Chile. It’s main job has been to examine the sky in submillimeter wavelengths to lead the way for the ALMA array that has followed it – basically to find cool stuff for ALMA to look at in greater detail. A surprise awaited the astronomers when they realized where these stars in the Spiderweb Galaxy are forming. As its name suggests, the Spiderweb Cluster has lots of threadlike arms stretching outwards from its centre. Astronomers expected to find most new stars forming in the middle of this giant galaxy. But they actually found that instead, most stars were forming in a small region caught on one of its spindly threads, and not in the center at all! This city of stars is developing asymmetrically! Here’s a Cool Fact:To make this discovery, astronomers had to brave 40 hours in a telescope control room that sits in the Chajnantor Plateau of Chile, 5,100 meters high! That’s 300 meters higher than Mont Blanc in the French and Italian Alps!